Thank you for all the love on our holiday playhouse this week!!! I am so happy you love it as much as I do. 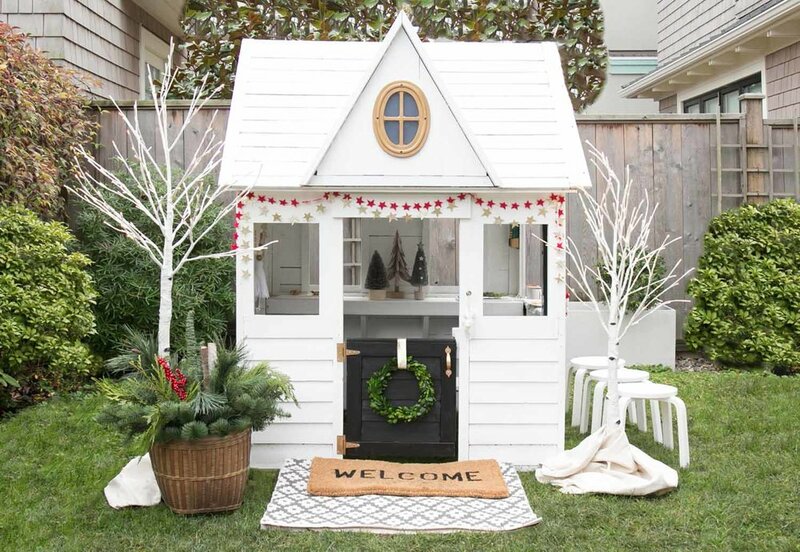 If you are thinking of getting a playhouse for your little ones for Christmas, I still love these wooden playhouses for this project. If you are curious about how we achieved this look from the original playhouse, please find the details here. 01. // Playhouse; 02. // Birch lit tree; 03. // Boxwood wreath; 04. // Mini mugs; 05. // Welcome mat; 06. // Holiday garlands; 07. // Playhouse stools; 08. // Diamond rug. If you're looking for a fun and rewarding summer project, the playhouse makeover is for you. Here are the sources that brought this project together, as well as 2 cans of Behr paint. The kids LOVE the result and so do we. Enjoy! 01./ Wall vases; 02./ Wooden playhouse (similar); 03./ Door mat; 04./ White chair; 05./ Light garland; 06./ Market basket; 07./ Chalkboard sign; 08./ Chalk pens; 09./ Play table.